SPS heat shrink cable termination kits are suitable for terminating polymeric (XLPE) and paper insulated lead covered (PILC) cables up to 3.3kV. This includes cable termination kits to suit EEMUA 133 lead cable 1.9kV/3.3kV 3 core BS5467. SPS heat shrink cable termination kits provide excellent protection against high humidity, chemical and dust contamination. Standard cable termination kit tail lengths - 300mm single core kits, 600mm 3 core kits. SPS heat shrink cable terminations are suitable for XLPE, PILC and EPR multi and single core cable networks up to 3.3kV - heat shrink cable terminations provide consistent performance in extreme temperatures, atmospheric pollution and ultra-violet light. 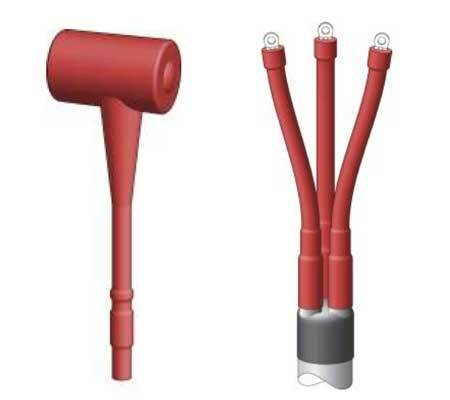 SPS 3.3kV heat shrink cable terminations for unscreened 3 core XLPE, EPR and PILC cables provide high resistance to humidity, chemicals and electrical stress. Non-tracking, sealant coated cable breakouts and core sealing sleeves ensure that the heat shrink cable termination has a long service life. SPS heat shrink cable terminations require no skill-sensitive taping, curing delays or special tools. Each termination kit can be used in the same way on cables with round or sector shaped conductors and various cable screen types. Heat shrink cable terminations are slim design for jointing and terminating cables into confined switchgear, transformers and electrical equipment. SPS heat shrink cable terminations feature adhesive linings on the inside of anti-tracking heat shrink tubes and breakouts. As the cable jointer heats the tubings, the shrinking action causes the adhesive sealant to melt and flow providing further cable termination protection from water, duct and air pollutants. SPS heat shrink cable terminations use superior anti-tracking heat shrink tubings for exceptional erosion resistance and reliability.